It's easy to see what comes in through the front door, but sometimes it's what sneaks in through the side door that really grabs you. 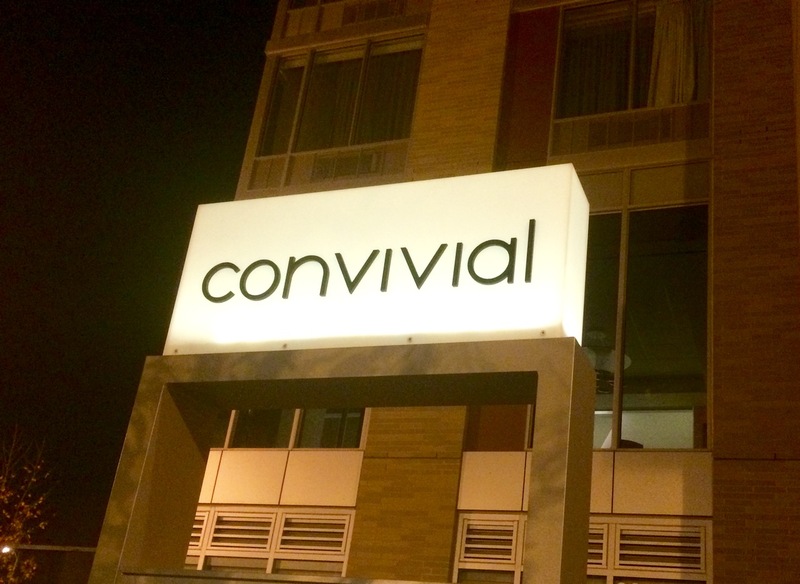 Take the recent openings of Momofuku CCDC and Convivial. The former may be getting the most attention, but the latter is getting the most praise. And deservedly so. While we enjoyed our dinner at Momofuku, what we ate at Convivial was more memorable. 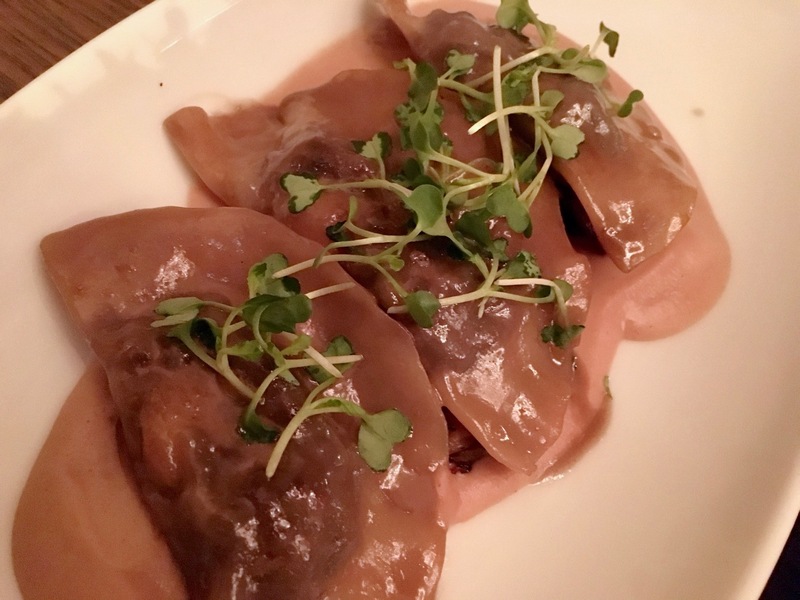 Fans of Mintwood Place--Cedric Maupillier's lauded Adams-Morgan restaurant--will be pleased to learn the chef has once again struck gold. 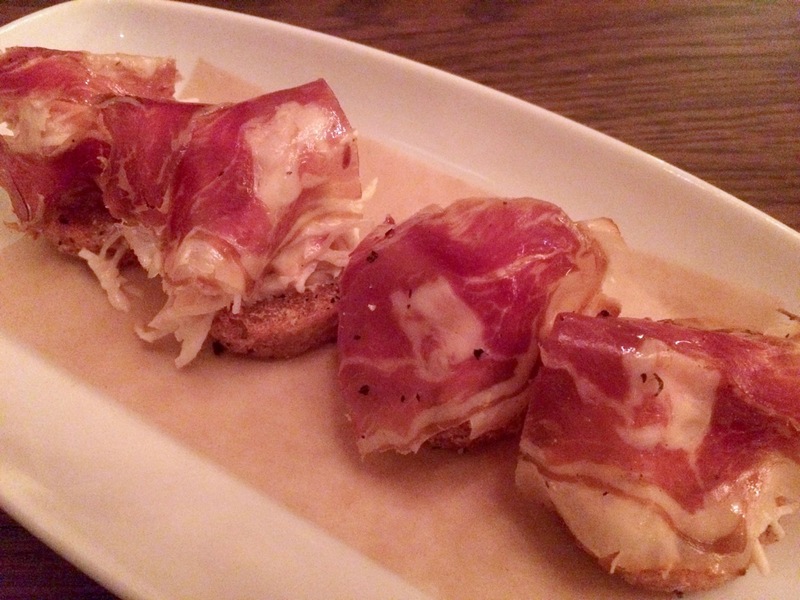 The excellent food, friendly service and stylish surroundings all hit the right note at Convivial. There are similarities between the restaurants, but key differences too. Like Mintwood Place, Convivial is an inviting space, but where the former restaurant's interior is more "classic," Convivial's is more contemporary--decked out in light and dark woods and huge glass windows courtesy of of HapstakDemetriou+ design firm. Also similar: the incredible food, although the focus is different this time. 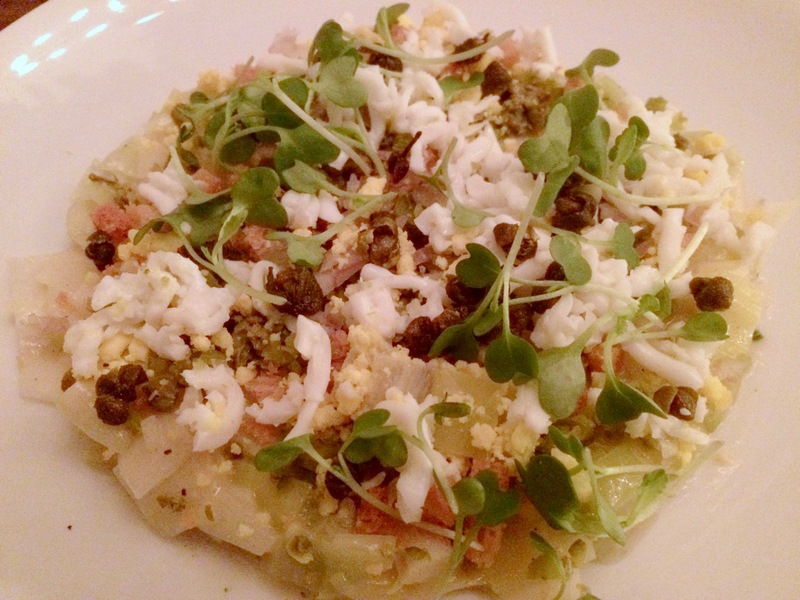 Where Mintwood Place is an eclectic mix of American and European influences, Convivial's is more French-focused. Yet the food still has the homey vibe you get at Mintwood Place. The menu is easy to navigate, divided into nibbles (small starters), cold dishes and hot dishes, with the latter two categories further subdivided into vegetable, seafood and meat dishes. Our "nibble" of choice was the latke, a plate of four little coins of fried potato goodness topped with a crunchy celery root slaw and dry-cured lamb (think prosciutto). A small but definitely satisfying snack to begin the meal. From there, we sampled a couple of the vegetable dishes. Leeks Dijonnaise finds leeks prepared at the sweet spot where they are cooked just enough to be tender and a bit crisp but not so much that they become mushy. Adding further texture are little bits of crispy crouton and fried capers to round out the fresh-tasting dish. 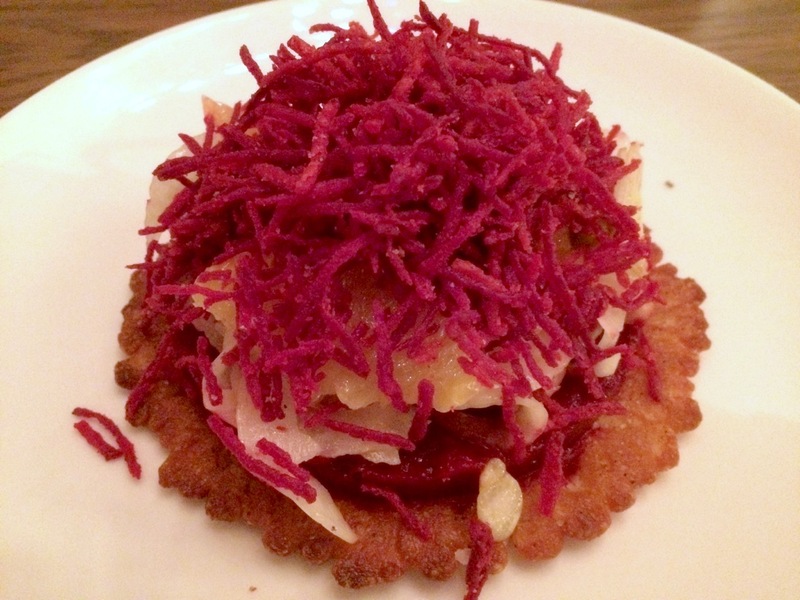 Socca--a chickpea flatbread--topped with a crunchy shower of fried beets and little citrus wedges was also quite good. Our warm entrees were just as satisfying. If you like ravioli (and who doesn't? ), Convivial makes a splendid sausage version with chestnuts and mushrooms that finds the pasta pockets cooked to just the right chewy texture. I'd heard--and our server pointed out--that their fried chicken "coq a vin" is becoming their signature dish, and I can see why. It was a knockout. Chris and I were talking earlier in the night about how fried chicken in restaurants is often disappointing. Not so here. 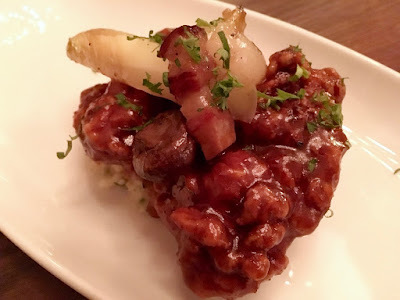 The preparation of boneless chicken thighs looks a bit like General Tso's Chicken, yet it tastes nothing like that sweet-and-spicy American-Chinese staple, sauced as it is with a wine reduction and served with potatoes, onion and bacon. You do get that nice interplay though between a crispy breading just starting to soften from the sauce poured over it. Usually when we eat out, we choose one dessert and share it. But at Convivial, we sprang for two. 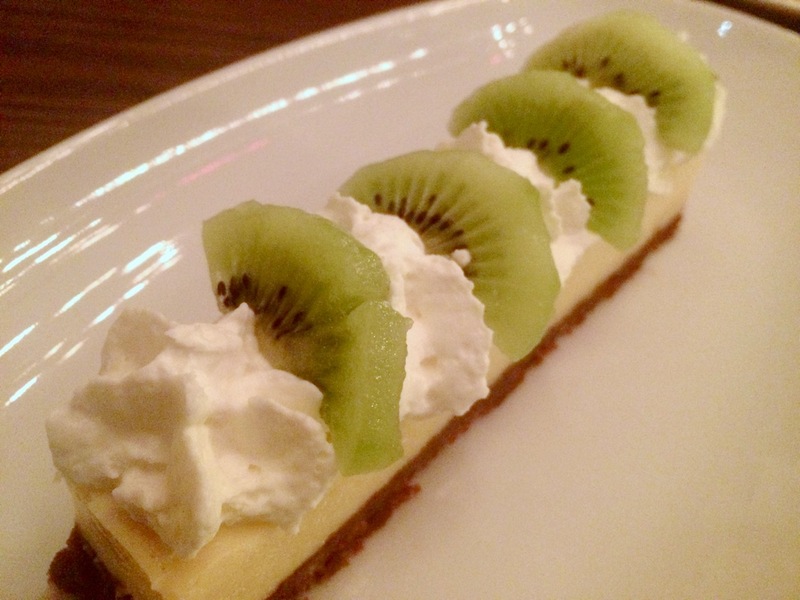 I'd heard the key lime pie made with a crust of speculoos cookies was good, so I had to try it. It wasn't just good, it was amazing. The lime custard was silky smooth yet firm enough to hold its shape and its flavor was the perfect balance of tart and sweet. I also loved the use of kiwi wedges, which provided both a counterpoint flavor and a visual nod to cut limes. The speculoos crust was also a nice departure from the usual graham cracker crust. And the milk chocolate crème brûlée? 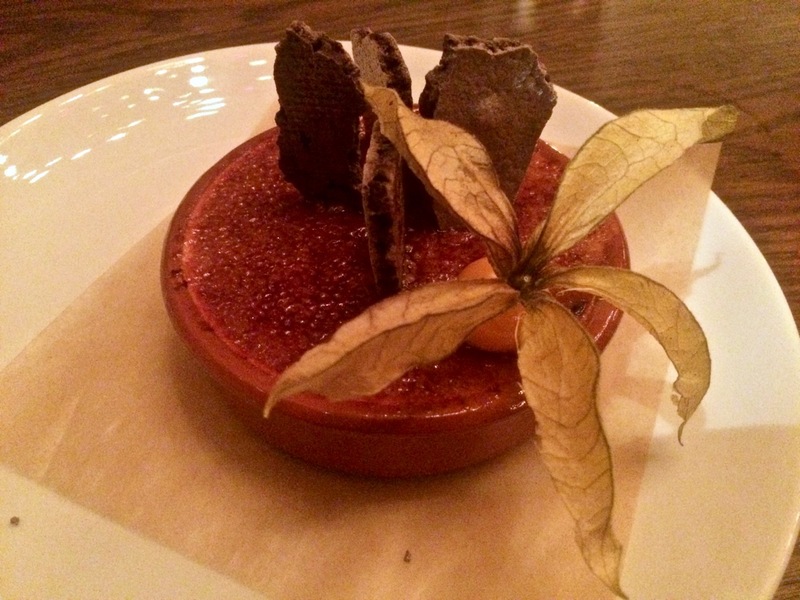 That was very good too: chocolatey, but not too strong, with a chocolate meringue and ground cherry garnish. The cocktails at Convivial were also nicely done. The menu offers a short selection of classic drinks. I started with a Vieux Carre, which is listed on the menu, a blend of rye whiskey, cognac, Benedictine herbal liqueur and sweet vermouth. After than I really wanted a Manhattan, so I asked a roving manager-type who offered to bring us another round if they could make a good one. He promised that they did and offered to let me see the bar "bible," a much longer list of cocktails than what appears on the dinner menu. How fun! I was committed to the Manhattan, so I declined to see the "bible" (although I should have let him bring it, just for curiosity's sake). The Manhattan was excellent--the best I've had in a restaurant yet. Service at Convivial was good. The hosts greeted us warmly, even though our lost cabbie meant we were about 15 minutes late. We also developed a great rapport with our server, who gave us a good overview of the menu when we were first seated. Runners were a little too enthusiastic about clearing plates, but not so much that unfinished items were removed without us wanting them to be (I do wish restaurants would leave bread on the table--it's often wonderful for swiping through main-course sauces). According to Webster, "Convivial" means "of or relating to social events where people can eat, drink, and talk in a friendly way with others." With food this good, there's no excuse not to be in a friendly mood while dining here. Convivial, 801 O Street NW (at 8th Street NW), Washington, D.C. (Shaw). (202) 525-2870. Reservations: Open Table.